After enjoying tremendous success during its release in 2010, the Air Jordan Force 4 Premier will hit the market once again this month and is expected to create a lot of buzz again in the sneaker world. 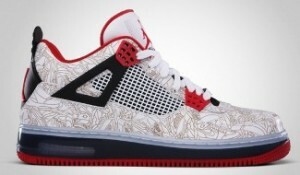 Also known as the “White Laser”, the new AJF 4 features the same design of the original edition of the shoe, the Air Jordan 4, which was the first Jordan shoe to feature a laser-etched design that somehow revolutionized the sneaker world. Considered as one of Jordan shoes’ best sellers of all time, the White/Varsity Red-Black will be an instant hot item in the market starting this Saturday 5 March!